To see a map page and associated route, click on the left-hand menu. 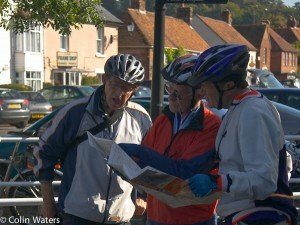 Besides displaying the route on the map there are also some details about coffee stops/lunch stops used and when the route was last cycled by the club. Please note that although all the routes have actually been ridden by Fleet Cycling, road conditions may be very different on the day and Fleet Cycling accepts no liability for the road conditions on the day of the ride(s). Ride leaders may post a different GPX/TCX/FIT file or link to Ride With GPS of their proposed route before each ride on the Facebook page. Posts on that page are also visible shortly afterwards on the Home page of the Fleet Cycling website, and the Home > Upcoming Rides page. New riders may wish to familiarise themselves with the route before the ride. If you have issues with the ride details, please contact the ride leader. Please note that posts on the Fleet Cycling Facebook Group are not visible here on this site, due to Facebook API restrictions. Our routes are recorded with various Garmin GPS devices but be wary of changing road conditions, especially during the winter months. We have also given our club rides a star classification 1* to 5*. For an explanation of the star classification, see the About Our Rides page. All routes are embedded in the route page. If you are using the Ride With GPS app or a smart phone, click on "Send to Device" and follow the instructions. All routes are embedded in the route page. If you are using a Garmin, click on "View Main Page" and then click on the "Export" tab. FIT and TCX are the recommended formats for newer cycling-specific Edge devices such as the 820 and 1000 series. Older Garmin devices should be capable of reading the legacy GPX format. If there are interesting features to see on the ride, or hazards such as crossing busy roads, we have usually noted that on the map page. These old timers need to get a Garmin!